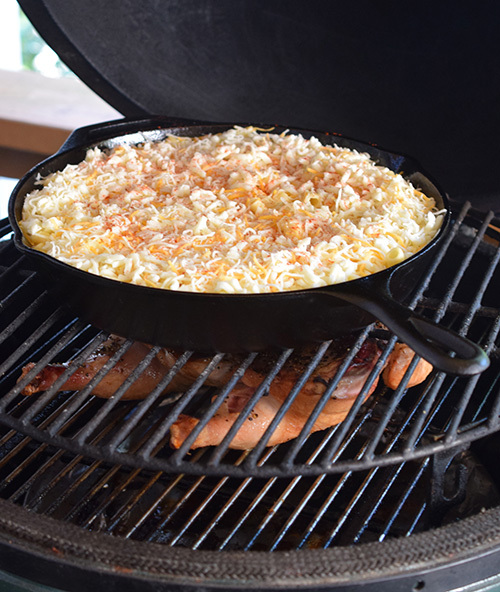 This is just a quick post because several people asked for Alexis' Skillet Mac and Cheese recipe for kamado grills, such as; Big Green Egg, Kamado Joe, or Primo. 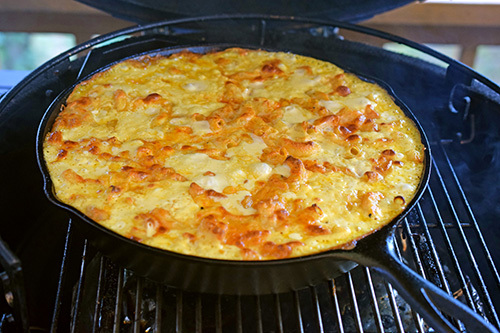 Any good grill would really work but the ceramic kamado grills are like a coal-fired oven, gracing the creamy mac and cheese with a golden crisp crust. This is one dish where I absolutely don't have a problem using Velveeta. We use other cheeses too. 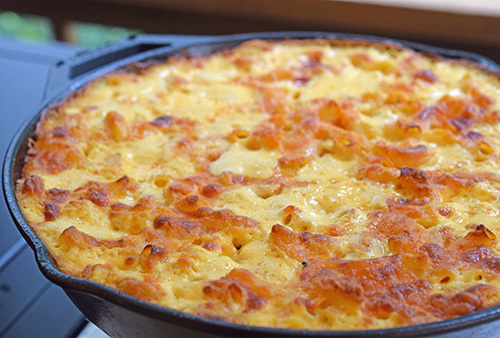 But for my baked mac and cheese, something about it's "processed cheesefoodishness" is just fitting. For the other cheeses, you can use whatever you like. We find that mozzarella or Oaxaca cheese make for a great gooey cheese. A sharp cheddar gives a bold taste of cheese. For baking, it is important to have a clean burning fire. The cheese sauce will soak up off tastes from the smoldering of poorly burning coals and you don't want that....no one wants that. You need good airflow so remember to use your Kick Ash Basket to shake off that ash from any coals you are reusing. We've bought them for every kamado grill that we have. Set up your kamado grill for indirect heat and pre-heat it to 350°f. This means using a heat deflector or plate setter (ugh....ok, "ConvEGGtor"....it's still a plate setter to me). Cook noodles according to directions. Drain and rinse them. In a medium stockpot over medium-high heat, combine the whipping cream, half and half, salt, pepper, and butter. Bring to a very low simmer. Stir in the Velveeta in small batches until it is all combined into the sauce. Mix the noodles into the sauce, tossing to fully coat them. Lightly grease the inside of a 12" skillet with tallow, butter, etc. Don't preheat the skillet. Pour the mac and cheese mixture into the skillet. Top with the shredded mozzarella and cheddar. Sprinkle some paprika (just enough to lightly dust) and breadcrumbs (if desired) across the top. Place in the grill, up on a raised rack if possible to take advantage of the heat reflecting off of the dome. Close the lid and cook until golden and bubbly on top. This will be about 50 minutes to an hour. Remove from the smoker, let it rest a few minutes before serving so no one burns the roof of their mouth with the lava hot molten cheese. 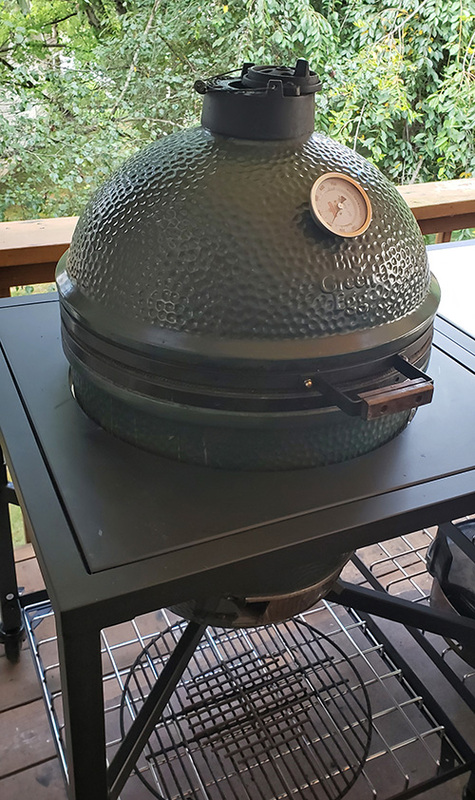 I've been using this new Big Green Egg® Modular Nest (table) system for a couple of weeks now and I love it. We got ours at Mannix Pools and Grills in Winter Haven, FL - great service as always. My set up was using an adjustable rig (Ceramic Grill Store) with a spider rig and stone for my heat deflector. I had a spatchcocked chicken in there for Alabama style smoked chicken with that crazy good white BBQ sauce. Just about perfect. Starting to get the crispies but also still have the wells of cheese bubbling up. 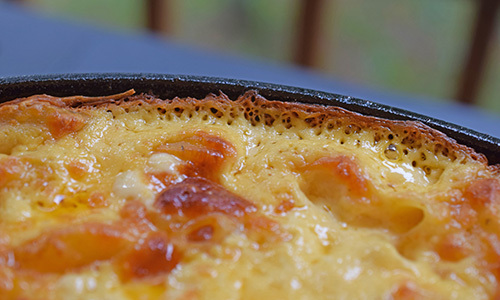 The best part of skillet mac and cheese is this....golden "cheese brittle" around the edges. De-freaking-liciously crispy!